Extraordinary lively and uplifting mix of ripe hibiscus fruits, blood orange, mandarin and pomegranate give an instant emotion of joy and happiness. The fragrance has a slightly sweet background of peach and a hint of caramel. Isle Of Wolf are premium handmade candles from the historic Vilksala manor, made from 100% pure plant wax and scented with 100% natural aromas obtained from pure essential oils. The natural wax and lead free wick ensures a clean and long lasting burn emitting elegant fragrance. Vilksala is a family owned authentic manor house in the West of Latvia, that has revived the traditional craftsmanship of candle making. 100% pure plant wax & scented with 100% natural aromas obtained from pure essential oils. Natural cotton wick sourced from suppliers of Better Cotton Initiative Programme. For the best burning and scent qualities burn candle for 3 hours at a time, or till wax pool reaches the edge of the glass. Do not burn longer than 4 hours. Trim wick to 5mm. Place candle on heat resistant surface clear of flammable materials. Warning - glass is hot when lit! 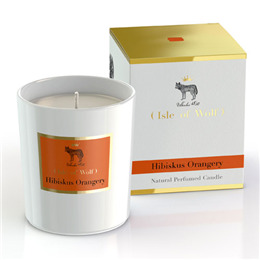 Below are reviews of Isle of Wolf Natural Perfumed Candle - Hibiskus Orangery by bodykind customers. If you have tried this product we'd love to hear what you think so please leave a review.